234 pages | 10 Color Illus. Off-grid isn’t a state of mind. It isn’t about someone being out of touch, about a place that is hard to get to, or about a weekend spent offline. Off-grid is the property of a building (generally a home but sometimes even a whole town) that is disconnected from the electricity and the natural gas grid. To live off-grid, therefore, means having to radically re-invent domestic life as we know it, and this is what this book is about: individuals and families who have chosen to live in that dramatically innovative, but also quite old, way of life. 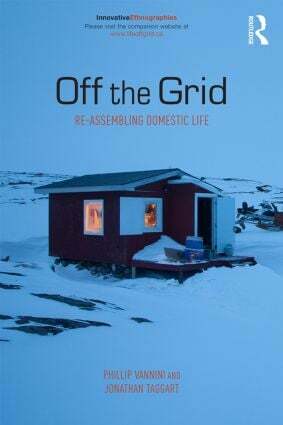 This ethnography explores the day-to-day lives of people in each of Canada’s provinces and territories living off the grid. Vannini and Taggart demonstrate how a variety of people, all with different environmental constraints,　live away from contemporary civilization. The authors also raise important questions about our social future and whether off-grid living creates an environmentally and culturally sustainable lifestyle practice. These homes are experimental labs for our collective future, an intimate look into unusual contemporary domestic lives, and a call to the rest of us leading ordinary lives to examine what we take for granted. This book is ideal for courses on the environment and sustainability as well as introduction to sociology and introduction to cultural anthropology courses. 1. Grids 2. The pull of remove 3. Involvement 4. (Off)Roads 5. Power constellations 6. Comfort 7. Convenience 8. House building, DIW-style 9. Slower homes 10. Breaking Waters 11. Camping, out on the land 12. The New Quietism 13. A Better Way of Life? Phillip Vannini is Canada Research Chair in Public Ethnography and Professor in the School of Communication & Culture at Royal Roads University in Victoria, BC, Canada.. He is author of dozens of journal articles and book chapters, and author/editor of ten books. Jonathan Taggart is a Vancouver-based photojournalist and member of the Boreal Collective. He holds a MA in Intercultural and International Communication. His photography exhibits have captured national audiences and his pictures have appeared in magazine and newspapers across the country, such as (for example for this project) Canadian Geographic, Yukon: North of Ordinary, BC Business, and The Tyee. Amongst other awards, he is the recent winner of the 2012 Western Canadian Music Award album cover design.